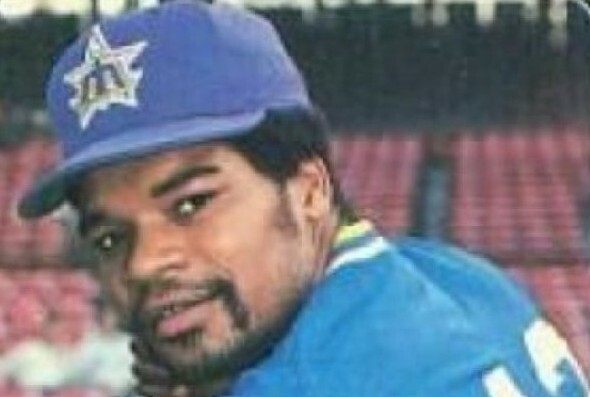 Dave Henderson, selected by the Mariners in the first round of the 1977 draft, spent six seasons playing center field in the Kingdome. He passed away Sunday morning. Dave Henderson, who played 14 seasons in the majors, including six with the Mariners (1981-86) after they selected him in the first round of the 1977 amateur draft, died Sunday at Harborview Hospital in Seattle following a massive heart attack. Henderson was 57. Henderson is survived by his sons, Chase and Trent, and his wife Nancy. His first wife, Loni, also survives him. Born July 21, 1958 in Merced, CA., “Hendu” graduated from Dos Palos High School in 1977. The Mariners made Henderson the first No. 1 pick (regular phase) in franchise history. During his six seasons in Seattle, Henderson played in 654 games and hit .257 with 79 home runs and 271 RBIs. The club traded him, along with SS Spike Owen, to the Red Sox Aug. 19, 1986, for a package of players. After spending two seasons in Boston, Henderson played six seasons in Oakland. He finished his career in 1994 with Kansas City at age 36. Henderson hit .258 for his career with 197 home runs and 708 RBIs. He is perhaps best remembered for the two-out, two-strike home run off Donnie Moore in the 1986 ALCS that helped send Boston to that year’s World Series, in which Henderson batted .400 with two home runs in a losing cause to the Mets. Henderson’s greatest success came with the A’s from 1988-91 when the Athletics reached the World Series three times. Henderson, who won a World Series ring in 1989, made his only All-Star team in 1991. In eight postseason series, Henderson batted .298 with seven homers and a .570 slugging percentage. “Dave was well known, and well loved, for his always positive attitude and huge smile,” the Mariners statement said. “He cared deeply for his family and his community, raising hundreds of thousands of dollars to support research into Angelman Syndrome (www.angelman.org), a genetic disorder that affects his son, Chase. Henderson underwent a kidney transplant in October. I’m stunned at this news. Thoughts and prayers to the Henderson family at this time. So startling…and sad. In addition to his playing, I really enjoyed his contributions to the Mariners’ radio broadcasts for several years. Here’s to Hendu! ❝my neighbor’s stride mother is making 98$ HOURLY on the internet❞…. Hendu was a bright light on those great A’s teams. And amazing the A’s got him so quickly after what he did for Boston. As for his Mariners years, however, it is hard to really place him, except beside his “twin,” Steve Henderson, and at that time I had a hard time really seeing Henderson’s talents that shown so much more brightly after he left the Mariners. But then again, you could probably say that about every player that ever has played for the Mariners. Still, as mentioned, it was fun watching Henderson play, especially when he was with the A’s. I remember a Hendu story from one of the early ’90s All-Star Games, when the AL players were being introduced. His Oakland teammates like Canseco and Rickey Henderson got booed, but he instead got a nice round of cheers. Henderson turned to another player and said, “They don’t boo Hendu.” Very true.